perfection. Prior reviewers have said it all. I must admit that I was a bit disappointed when listened to these CDs for the first time. 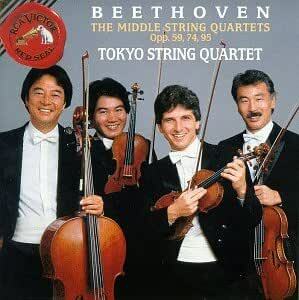 I had previously bought the Tokyo's recordings of the late string quartets which comprise first class playing by the Tokyos and the sound quality (especially the accoustics) of their late quartet recordings is excellent. Here, however, the playing can be described as underpowered or lacking heart. The middle quartets are highly emotionally charged works that require not only high quality playing technically speaking but also intimate emotional involvement which I can't say the Tokyos achieve here. I think part of this perception of mine can be attributed to rather poor accoustics (at least compared to the late quartets). The sonics are clear but the playing sounds powerless and lacking life. Here I have focused on the negatives but I want to make clear that the quality of the playing in other respects is excellent. They connect and play perfectly together. I recommend the New Hungarian Quartet renditions instead. This is perfection. The Tokyo quartet plays with very much sense of the architecture of the music. If you like your Beethoven played with restraint, refinement, sense of the interior drama of the music, this is it. The Tokyo quartet is never over-dramatizing, but let the music speak for itself. Compared to the Takacs quartet, I think the Tokyos are generally more elegant and balanced on the middle quartets, their tempos generally not slower, and they never exaggerate. The Takacs is more exciting though. If you plan to buy the opus 18 quartets, go for the Takacs quartet - more concentration and excitement. For the late quartets, nothing compares to the religious readings of the Tokyo quartet.